From now until the big departure I will be posting a weekly Foodieseeker Friday post. We are now counting down the sleeps until we go. Now that the holiday is getting closer I am thinking more and more about what we will need for our holiday. Being a family of five, and someone who does not pack lightly, I have a feeling that my lists are going to be long. But it is going to be important that I remember the holiday extras such as sun hats, sun cream and swimming aids for the twins. So far I have got the sun protection sorted and swimming aids are due to arrive. I will be telling you all about them in a future Foodieseeker Friday post! Today I thought that I would tell you a bit about our accommodation on Carnival Vista and activities that we are most looking forward to. Having children with a big age gap it was important that we would be able to have connecting rooms. This is exactly what the Ocean View Staterooms offer. So we will have the three children in one room and us adults in the other. This will enable us to let the twins go to bed before J and have their own space. It is important that J has this time with us in the evening as the twins do tend to take over. As much as it would have been lovely to have a balcony, when travelling with small children it was not something that we wanted to have. But having the ocean view to gaze out on is going to be simply wonderful. Standard room service is included in the cruise package and there are other dishes that you can add for a fee. So I know that we will be enjoying a room service breakfast one morning! So, that is our accommodation, now on to what we plan to get up to on our cruise. You may remember in a previous post I talked about what excursions we wanted to go on. Since then we have spent a lot of time reviewing this and discussing what would be best for us as a family. We have now decided that we will not be taking any excursions. The places that we will be stopping off at are places that we could potentially visit in the future. But realistically, a family cruise, is going to be a once in a lifetime holiday. So instead of leaving the ship to explore we have decided that we are going to stay on Vista and thoroughly enjoy everything that the ship has to offer. 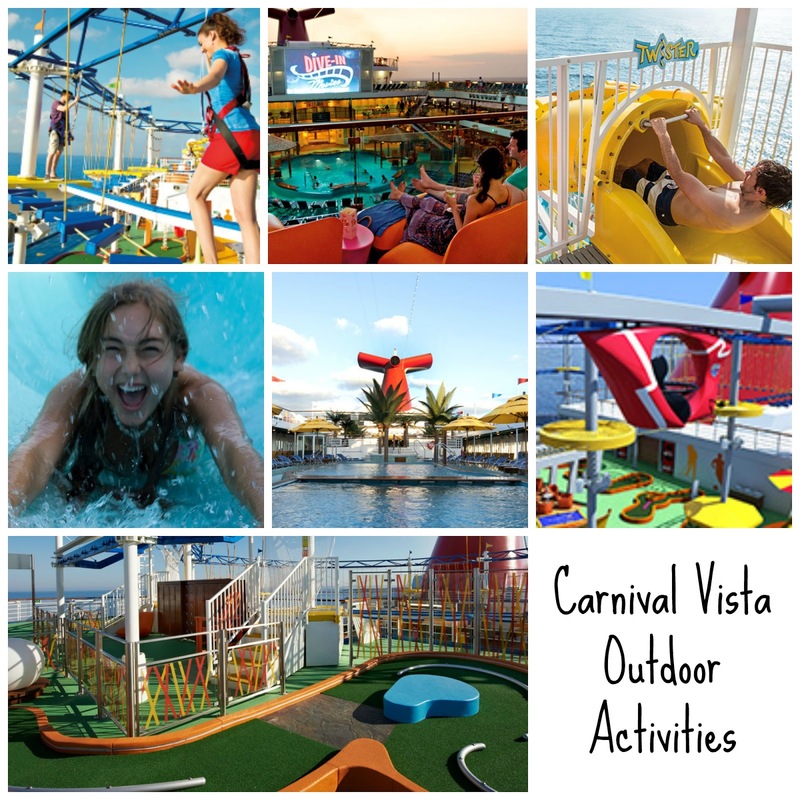 There are simply so many activities and things to do on Vista we do not want to waste a single moment. We are currently looking at all the ship has to offer and I am planning on making a list of things to do so that nothing is missed! The Skycourse - Not for me but I know J will love it! The Dive Inn Movies - Who would not love to sit outside on a beautiful evening watching a movie! Water Slides - You cannot beat a good water slide and I know that the we will definitely be making a splash! Pools - We love to swim and are looking forward to letting the kids have some fun in the water! Skyride - This is Carnival Vista's baby. The Skyride is a never done before attraction and one that we are looking forward to trying! Mini Golf - Yes, golf on a cruise ship! This will make a fun activity for all of us! Fun with Dr Seuss at Sea - There are so many Dr Seuss activities for the children that include a library, green eggs and ham breakfast, Dr Seuss parade and story time! Little Owls - Vista certainly cater for families. Not only do they have their kids clubs running throughout the day but also do a Night Owls club. This is where the children can have their own little pyjama party, giving mum and dad an evening off! Thrill Theatre - This is going to be one for J as I think the twins will be too young but the Thrill Theatre sounds like a great mum and J or dad and J activity! IMAX - This is another one that we are all looking forward to. The children all love going to the cinema so I know they will all love the IMAX! While the children are enjoying their activities I am looking forward to having some rare time with the hubby, just the two of us! 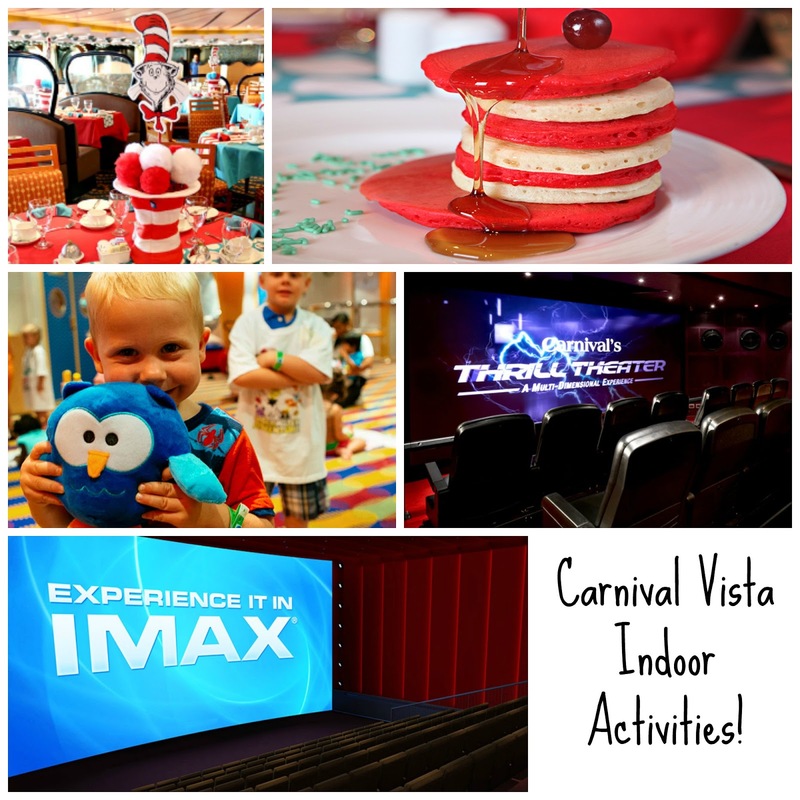 Vista have such tempting activities for us adults to enjoy without the children! Serenity Adult Only Retreat - They sum it up perfectly "The world you'll find yourself in is one of complete peace, sea breezes, swaying hammocks and, of course, a nearby bar. It's the place to get done the kind of stuff you just can't seem to do anywhere else - reconnect with your partner, finish that book, or do absolutely, blissfully, nothing at all!" Cloud 9 Spa - In the past the hubby and I have enjoyed spa days so we know it is something that we love to do. We particularly enjoy the thermal rooms. I can just picture us both, lazing in this thermal room over looking the ocean! Massage - Carnival are treating me to a spa treatment and I have chosen to have a Bamboo Massage and will admit to really looking forward to it! As you can see there is so many things to do and I am sure you can see why we have decided to stay on this extraordinary ship. This really is going to be a once in a lifetime holiday! Disclosure: We are Carnival Cruise Lines Foodieseeker Family. 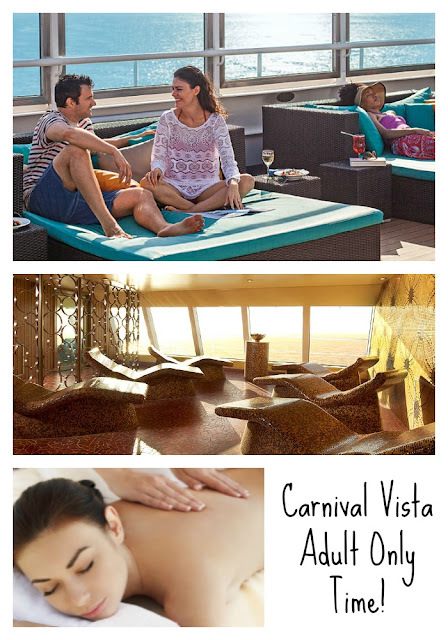 The pictures used are courtesy of Carnival.